Dinner tonight was a weird hodgepodge of leftovers – the kids had bean burritos, I finished off some pasta, my husband had an egg sandwich – squeezed in between a Girl Scout meeting and choir practice. It wasn’t the prettiest meal I’ve ever put together, but it was good enough. 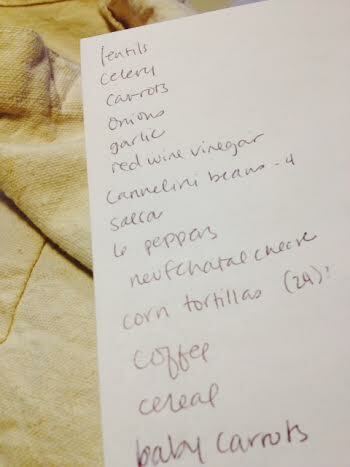 I’m not sure when I became the chief cook and grocery shopper in our family. I guess it’s because I usually get home a little earlier, and I have a weekday off, which makes for a much easier trip to the store than Saturday mornings. So I’ve been doing this for awhile now, meal planning, grocery shopping, weeknight cooking, and I have to say… I kinda like it. I like the challenge of it: finding recipes I can pull together quickly, sticking within our grocery budget, using as much produce from the farmer’s market as I can, or making a meal out of what I can find in the grocery store’s discount bin. More than that, though, it’s become a sort of intentional practice, especially when I pay attention. It gives a rhythm to my week. It gives us a moment as a family in the midst of hectic days. It’s a creative practice, sometimes; I like how the food looks on the plate, I like figuring out if I can pull a full meal out of what’s left in the cupboards, I like the trial and error of testing out a new recipe (as it turns out, homemade falafel is not nearly as easy as it looks). It’s most certainly a practice of gratitude – for access to good, healthy food, for the time to prepare it, for the family with which to share it. Don’t think there aren’t days when we call out for pizza, or days when I wish everybody could just feed themselves and I’d curl up on the couch with a bowl of cereal, like I did back before there were kids involved in the dinner equation. But on the nights when things go well, when we sit down together and there’s a meal that includes at least a couple of food groups – those are some of my favorite moments of the day. One night last week, the kids were playing together relatively nicely in the other room, and I was on my own in the kitchen. Dinner was sauteed kale and a cheese omelet, made from eggs given to me by a friend who raises chickens. Quick, easy, healthy, and liked relatively well by everybody in the family. I poured a glass of wine and turned on my Pandora station, which was playing something very boppy by Katy Perry, stirred the kale, and realized I was enjoying myself. Somewhere along the way, cooking dinner stopped feeling like a chore, a burden, one more thing to cross off the never-ending to-do list of family life. This task of feeding my family’s tummies has become something that feeds my heart and soul. Now, if I could just feel that way about doing the dishes.